I did a piece this morning for ABC News on the body language of President Obama and President Putin during their time together at the United Nations in New York. Here is the piece followed by the videos I analyzed. http://bit.ly/1KJ09ir. WASHINGTON (SINCLAIR BROADCAST GROUP) — President Obama is done playing politics when it comes to Russian President Vladimir Putin, based on his interactions with the world leader at the United Nations on Monday. "He's letting the world know he is not very happy with Putin" explained Body Language Expert Patti Wood. While most politicians have their "game face" that shows that nothing bothers them, Wood said Obama made the choice to use his body language to express his feelings toward Putin on Monday. Overall, Wood described, Obama used "a cluster of cues" to tell Putin "I don't respect and honor you enough to give you my time, to enjoy this process or enjoy this moment.. I'm being forced to do this"
While Wood explained that Obama has been more likely to show his displeasure in certain situations than other Presidents she has observed "this was really obvious." "It is highly unusual to show that much emotion," Wood noted. Wood described Obama's body language "was more disgust than displeasure it was more profound he made the choice to say I'm displeased, I'm disgusted, I don't want to have a relationship with you." "Obama feels strongly enough to show his feelings to the entire world," Wood said, and everyone is paying attention. "The whole world is noticing this," Wood commented. 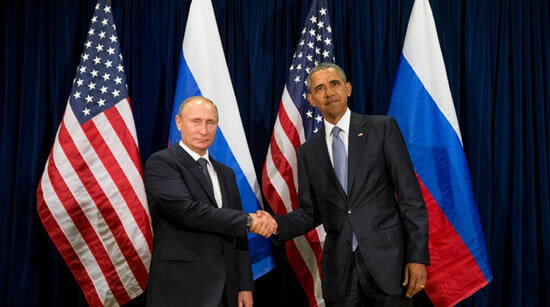 Obama appeared pained to even be in the same room as Putin for a photo opportunity. Wood noticed that he didn't' walk all the way into the room where members of the press were eagerly snapping photos. "Usually a handshake approach in those kinds of setting everything is slowed down for the camera Obama did a couple of things to make it short and brief." Making the moment as short as possible, Wood said, Obama "showed his dislike and disrespect." Keeping the photo opportunity brief was just one of the actions Obama took to show his disrespect for Putin, Wood noticed. Describing the handshake itself, Wood noticed Obama "swung out his fingers like he wanted to smack Putin up the side of his face." Wood described the way Obama "flung out his fingers" as a "weapon gesture" which she said is not often seen in a stylized handshake. Wood saw no indication that Putin was phased by Obama's cold demeanor. She noted that during the handshake "Putin went on top, to show his power and control and his dominance, that's just the way he is, that isn't purely situational." Analyzing the smirk Putin was caught making while toasting with Obama during lunch, Wood explained that a smirk is an indication that a person is feeling one thing, but having to act in a different way. Putin's smirk, Wood analyzed was him thinking "I'm so much better than this, I'm so much smarter than them this is just ridiculous that I have to be here." The notion of having to be present against their will may have been the only mutual feeling Obama and Putin shared Monday. Asked to sum up the interactions between the two world leaders Wood described them as "forced."